Over recent decades, pasta makers have become more and more inventive. I guess that’s why the choice for pasta cooks and eaters seems endless at times! Nowadays, there are some wonderful pasta shapes to cook with, as well as pasta made from different kinds of flour including gluten free and pasta coloured with natural colourings from veggies such as spinach, beetroot etc. 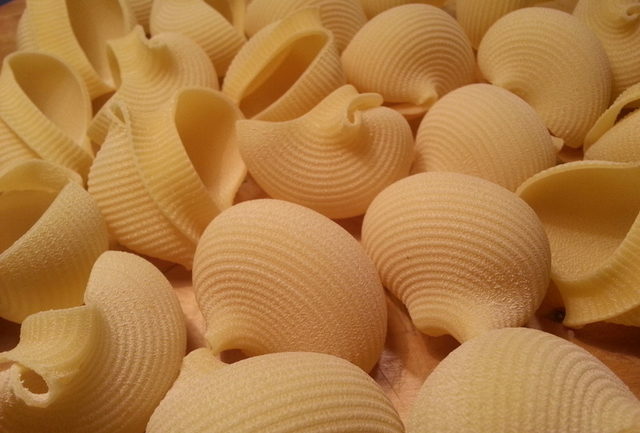 Some of these more recent pasta shapes have very creative designs and names such as cavatappi (corkscrew) radiatori (radiators) conchiglie (shells) and my new favourite lumaconi (snails)! 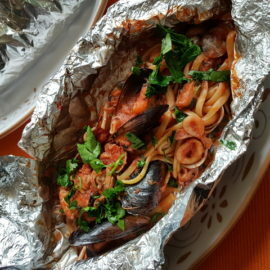 Lumaconi, also known as lumache, are big ridged pasta shells shaped like snail shells which are usually stuffed with a variety of fillings and then very often baked either relatively dry or covered in a sauce. 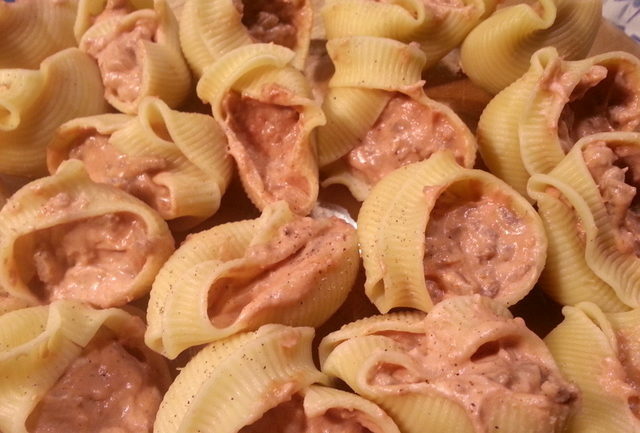 (see my recipe for beautiful stuffed and baked lumaconi! ) I love them because they are big enough to take quite a lot of filling inside and can even be eaten as finger food! For Italy’s pasta makers certain criteria have to be taken into account when creating a new type of pasta. Firstly, of course, taste! But also, consistency and texture. It’s important that the pasta works well with the sauces it is served with. By this I mean, certain pasta is better with light sauces, others taste better with heavier ones. 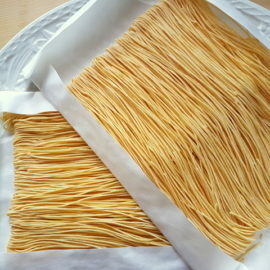 The pasta also needs to hold up to cooking and maintain its shape. In general dry pastas require much longer cooking than fresh ones, so this is even more important when producing dry pasta varieties. The lumaconi I used were pasta di Gragnano and they certainly lived up to all my expectations and the requirements for a first class pasta. I have already discussed Gragnano pasta in my earlier blog about lumaconi but if you are looking to buy and cook dry pasta and you are able to find it, Gragnano pasta is probably among the best dry pasta in Italy. The small town of Gragnano in Campania, where this pasta is produced, is historically the home of Italian dry pasta production, pasta having been produced there since the 16th century. 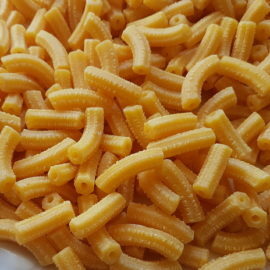 In fact, many pasta shapes originated there, including lumaconi. There are many reasons why the quality of this pasta is so high, but briefly the location, climate, water and production methods of Gragnano contribute to the production of an excellent pasta that is easy to digest, nutrient-rich, artisan and delicious! If you have never eaten pasta di Gragnano, give it a try if you can. It is sure to become your pasta of choice from that day forward! Of course there are other good pasta makers who produce lumaconi and if you can’t find the Gragnano pasta ones, do try one of the others. 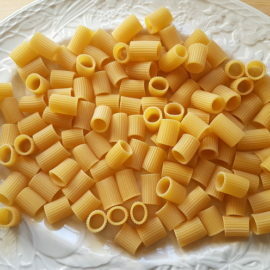 I’ll be posting other recipes for this pasta shape later on, but in the meantime do try the first one I put up recently. 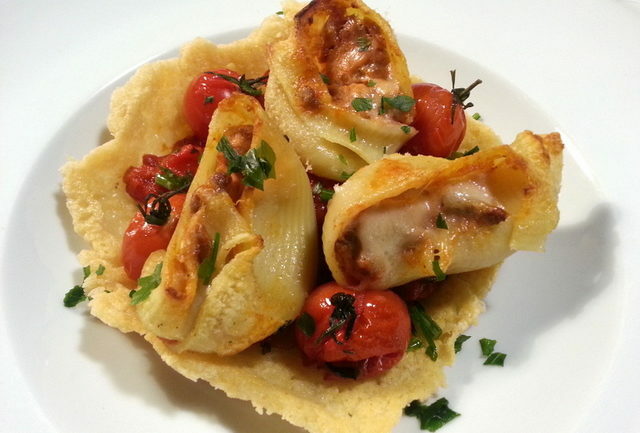 I’m sure it won’t be the last time you cook these wonderful snail shells!